King John (1166-1216) has long been seen as the epitome of bad kings. The son of the most charismatic couple of the middle ages, Henry II and Eleanor of Aquitaine, and younger brother of the heroic crusader king, Richard the Lionheart, John lived much of his life in the shadow of his family. When in 1199 he became ruler of his family's lands in England and France, John proved unequal to the task of keeping them together. Early in his reign he lost much of his continental possessions, and over the next decade would come perilously close to losing his English kingdom, too. 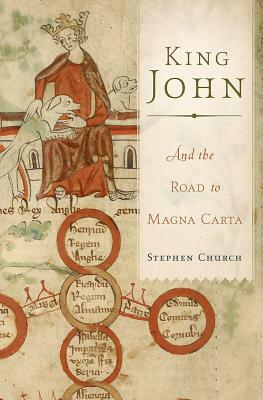 In King John, medieval historian Stephen Church argues that John's reign, for all its failings, would prove to be a crucial turning point in English history. Though he was a masterful political manipulator, John's traditional ideas of unchecked sovereign power were becoming increasingly unpopular among his subjects, resulting in frequent confrontations. Nor was he willing to tolerate any challenges to his authority. For six long years, John and the pope struggled over the appointment of the Archbishop of Canterbury, a clash that led to the king's excommunication. As king of England, John taxed his people heavily to fund his futile attempt to reconquer the lands lost to the king of France. The cost to his people of this failure was great, but it was greater still for John. In 1215, his subjects rose in rebellion against their king and forced upon him a new constitution by which he was to rule. The principles underlying this constitution--enshrined in the terms of Magna Carta--would go on to shape democratic constitutions across the globe, including our own. In this authoritative biography, Church describes how it was that a king famous for his misrule gave rise to Magna Carta, the blueprint for good governance. Stephen Church is a professor of medieval history at the University of East Anglia and the author of The Household Knights of King John. He lives in Norwich, England. "Magna Carta, the foundation stone of constitutional government in the English-speaking world, passed its 800th anniversary this year. Church explains with exemplary clarity how the charter emerged from the turmoil of King John's reign." "Working from the primary sources of King John's life and times, Church approaches each major event in the reign from the even-keel perspective of the moment those events were happening, to the extent that such moments can be known... it works surprisingly well."